OK, so July wasn’t a prolific blogging month for me but I did an awful lot of gardening (well, watering), singing (in Westminster Abbey, dontcha know) and (drumroll) reading – oh yeah and bit of writing too, but more about that in another post. I wanted to post up my thoughts on two books I recently bought at readings and have enjoyed a great deal. 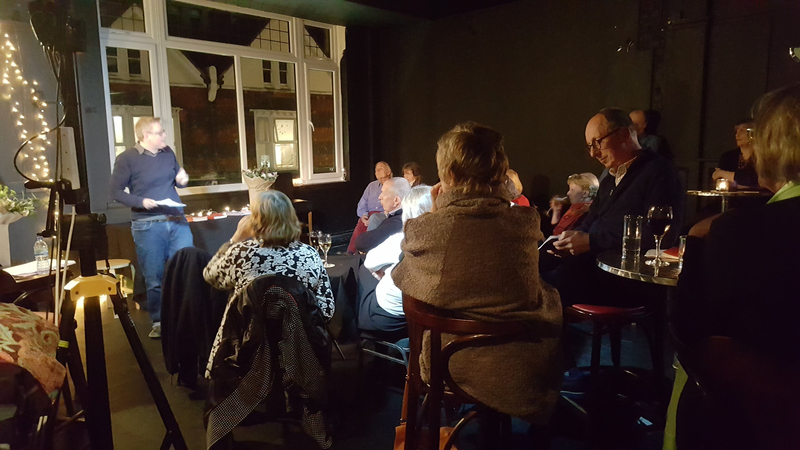 Hugh Dunkerley teaches creative writing at Chichester University and our paths have crossed a few times, but it was the first opportunity I had to hear him read when he came to Eastbourne Poetry Cafe earlier this month. I really enjoyed his poems and bought Hare, not a new book, but then again poetry books have a long shelflife. 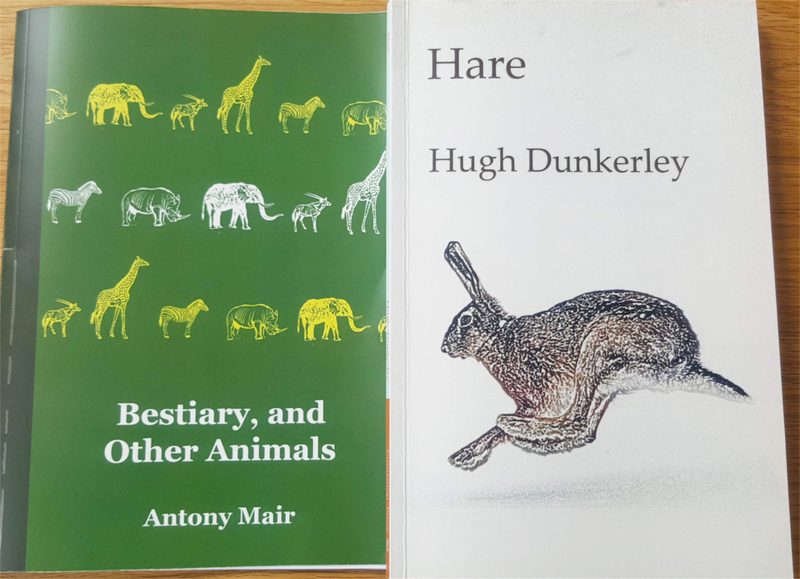 As luck would have it, I’d just been to the London launch of Bestiary, and Other Animals, the first full-length collection by Antony Mair. So it was interesting to read these two animal-themed collections back to back. Antony is a good poetry friend, the founder and mainstay of Hastings Stanza which has been so good for my writing, and a super-nice super-talented person. It’s very exciting to see him doing so well (another collection is in the pipeline I believe) – keep an eye out for his name. When I first picked up this collection, and seeing the cover especially, it brought to mind Ian Duhig’s The Lamas Hireling, its title poem a strange parable rooted in the myth and superstition surrounding hares. We have to wait until the end of Hare for the title poem, in which the narrator makes love to a woman who seems to be transformed during the act of coitus into the mysterious hare seen earlier ‘bounding […]/across the astonished fields.’ Myth and mystery make their play also in poems such as ‘The Guardians of the Water’ with its three strange night visitors, and ‘Discovery’ in which the shipwrecked ‘murmur dry mouthed prayers of thanks’ despite the forest ‘crowding out all thoughts of passage’. The book is in three sections. ‘In The Darkroom’ begins with a number of poems dealing with lone characters undergoing extreme or extraordinary trials, including an abducted child, an astronaut about to re-enter the Earth’s atmosphere and a woman who believed she could exist on air alone, setting out a number of recurrent themes: individuals facing end of life, returning from a near-death experience, or enduring loneliness in many diverse disguises. Actual death surfaces quite often, but many of the deaths are of animals or birds. Dunkerley seems to have an eye for birds in fact – magpies, bantams, geese and swifts all come under his gaze. The central sequence of sonnets (‘Under Cover’) deals with a doomed love affair, which at its climax resembles a ‘huge ship’ pulling out of dock as ‘wife, husband, children all slide away’. But before long the narrator is ‘wondering who she is’ and the it’s clear where things are going. Although this sequence strains against a hint of bathos, elsewhere in the collection there are poems of convincing sensuality, the most surprising of which are ‘Weasel’ and ‘Mussels’ (‘In the sink they open slyly,/ the occasional shift as one/nudges against another’). Personally I was more repelled than seduced by the image of a woman shaving her legs in the bath (‘Razor’) but it takes a brave man to write about periods (‘Cycle’) and intra-uterine insemination (‘IUI’). A lot of lovely wordplay in this collection. Some phrases I particularly enjoyed – ‘at night the stars rustled, tugging / at you with their tiny gravities.’ (‘Fast’) ‘It made a hole in the day/ where the bird had been’ (‘Killing Geese’), the baby ‘starting suddenly / at the zoo of her own voice.’ (‘Giant Steps’), the ‘slippery sacks of nothing/that were once squid.’ (‘In a Japanese Supermarket’). Shortlisted for the Live Canon First Collection prize, this book is a smorgasbord of animalia. It’s not nature poetry as such but more a meditation on human nature as reflected in, sometimes personified by, the creatures within its pages. In two sections, the first is the Bestiary of the title – an A to Z where each creature is identified solely by its first letter. There is a key at the end, but it’s more fun to try and guess. Some are much more obvious than others! A medieval concoction designed to both entertain and moralise, a bestiary presents all kinds of opportunities for the contemporary poet, and Mair has a great deal of fun with it. Some poems are heartbreaking reminders of man’s cruelty to animals, such as the elephant ‘hating these people that taught us shame’, or a panicked turtle caught in a fishing net. 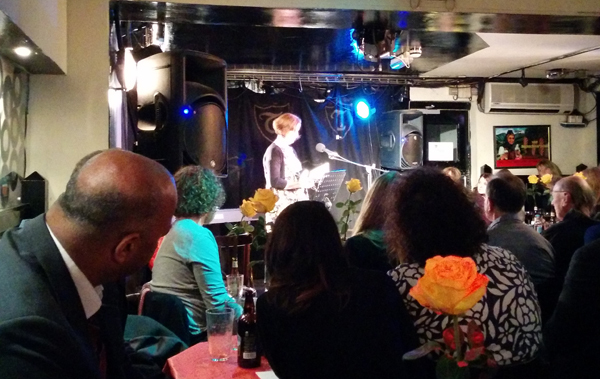 There are animals-as-human-stereotypes (bulldog, cougar) and reflections on loss, ageing and coping with trauma. ‘W’ surprises with its paean to a creature universally disliked, bouncing out its funny ending. As befits any animal-themed collection there are witty nods to Ted Hughes (for example ‘F’ and ‘P’) and some enjoyable satire, such as the poem-as-bureaucratic-report forming a sly comment on the destruction of natural habitats (‘Y’, for Yellowhammer). Mair is comfortable with form and subtle rhyme schemes, but just as happy to take risks. ‘H’ evokes a hawk in two simple lists of verbs, distilling the freedom, power and simplicity of its existence to a series of crisp actions. stretched ahead like a field of slate. ‘The Pigeon’ begins with the dilemma of what to do with an injured bird, and ends with a burden of guilt, comparing the bird’s destiny to ‘an abandoned child in a Darfur cellar / or others whose plight I turn my back on’. Antony Mair isn’t afraid of taking a stance and speaking out against injustice. He’s also happy to put the boot in from time to time where he sees fit. But there’s a tenderness and frankness to his work , a richness of language and reference, and attention to craft. the horse have its head. He knows the way home. Both books sound wonderful. I’m especially intrigued by Mair’s “meditation on human nature as reflected in, sometimes personified by, the creatures within its pages.” Nature and human nature-two of my favorite subjects. Thanks for bringing these books and poets to light for me.